Dear Friends and Fans of Jayson. If anyone still has happened by here, they will notice that Jayson has since retired from skating andthis page is long since out of date. Due to many other life events, I am not able to follow skating at the level I did and this page is purely archival. 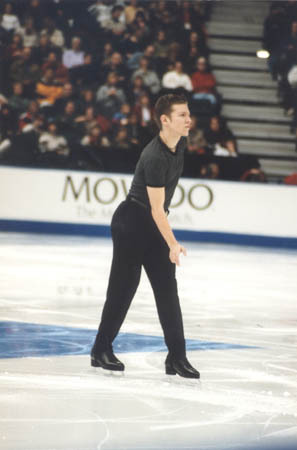 When I find a few spare months or years, I will attempt to update all my skating pages, including all information on Jayson that is still hanging about somehwere. Thanks for reading, if anyone is still there! It's been very fun. After a few years absence, I am returning to Canadians this year in Edmonton and am looking forward to seeing Jayson skate. I've had very little time and no resources to update this fan page, for which I profusely apologize, but I hope to remedy that in January. In the meanwhile, please enjoy the more 'vintage' photos and reports and think good thoughts for Jayson in Edmonton. I'll be the one tossing a hedgehog on the ice! Would you like to be on the Jayson Mailing List or join the Yahoo Group? Check the Jayson Support Page. Disclaimer: I am in no way connected with Jayson Dénommée or his coaches or anyone who trains at the same rink. (I speak with him occasionally and he knows about this page). This page is not official in anyway. My own opinions,etc. © 2003 Amy Mossman (amossman at geocities dot com ). Creative and other nudging by Angela Ferrara and Catherine Mooney.